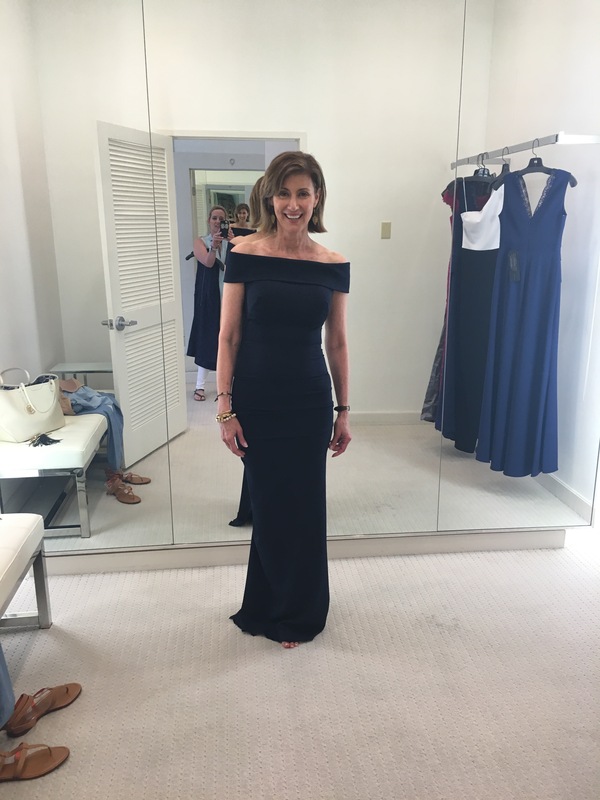 Bella MD - The Results - Fashionomics "every page"
This all started in the dressing room at Tootsie’s when Betsy Gallagher called and said I needed to shop for my wedding and she had the perfect dress. I hate to shop for myself and had been busy with client weddings. I only tried on two dresses, Dustin and Shane also gave the navy Aida the thumbs up. The only other person I asked was my husband, Bill, and he said I had to get it. You have to understand that he never has an opinion on fashion. I really liked the off the shoulder and ruffle detail in the back. Betsy is great at finding just the right things for me. So we ordered the size I needed and I was done. Until I took a closer look at the dressing room photos!! YIKES!!!! 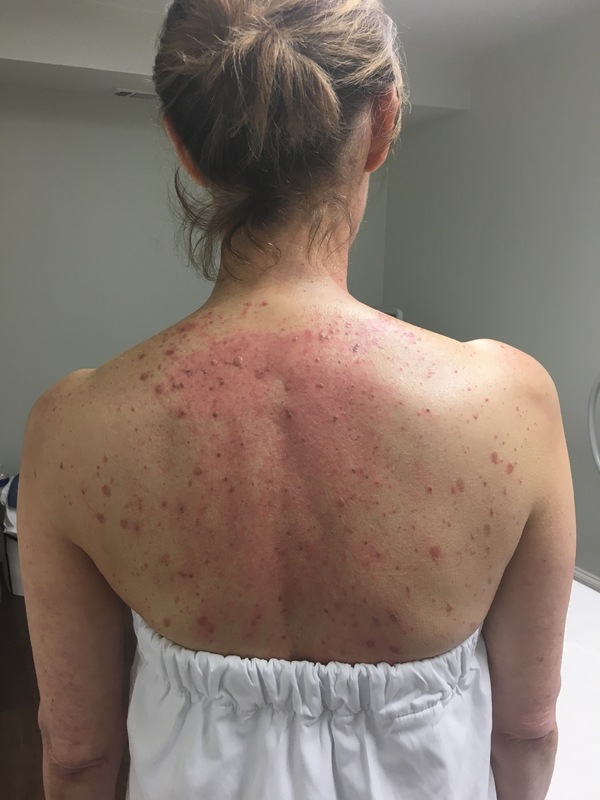 I recently posted a blog on my experience at Bella MD and the reasons I sought their services. 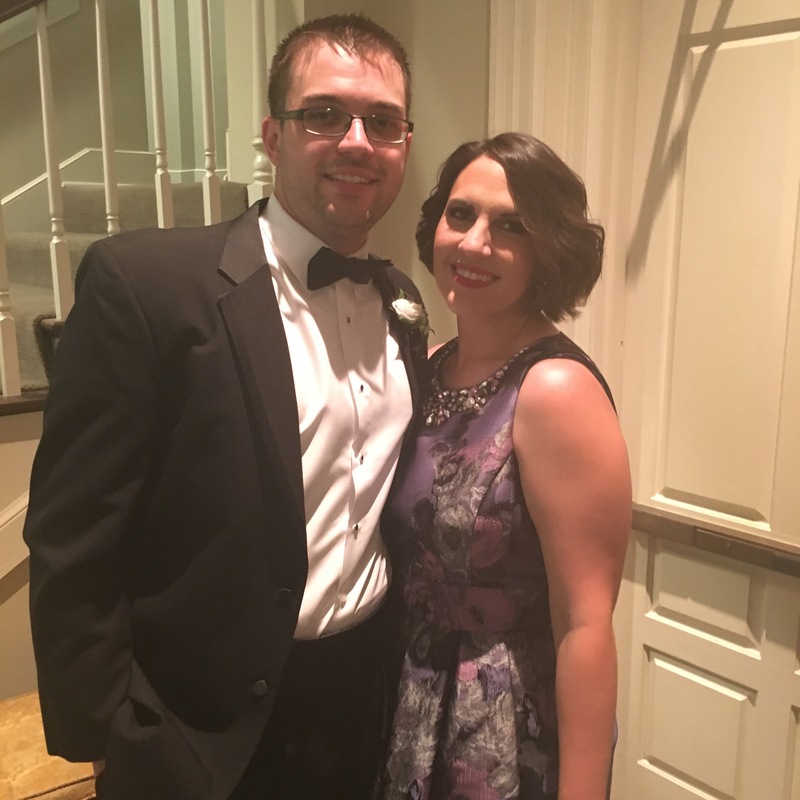 It really began with an off the shoulder dress for my son’s wedding in July. 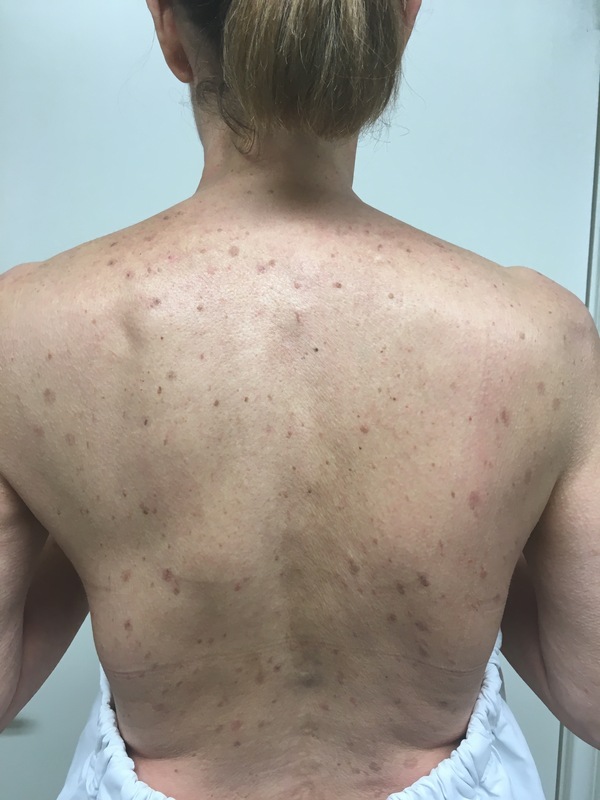 I took a closer look at the photos in the dressing and realized that my back and chest and neck areas did not look that great. 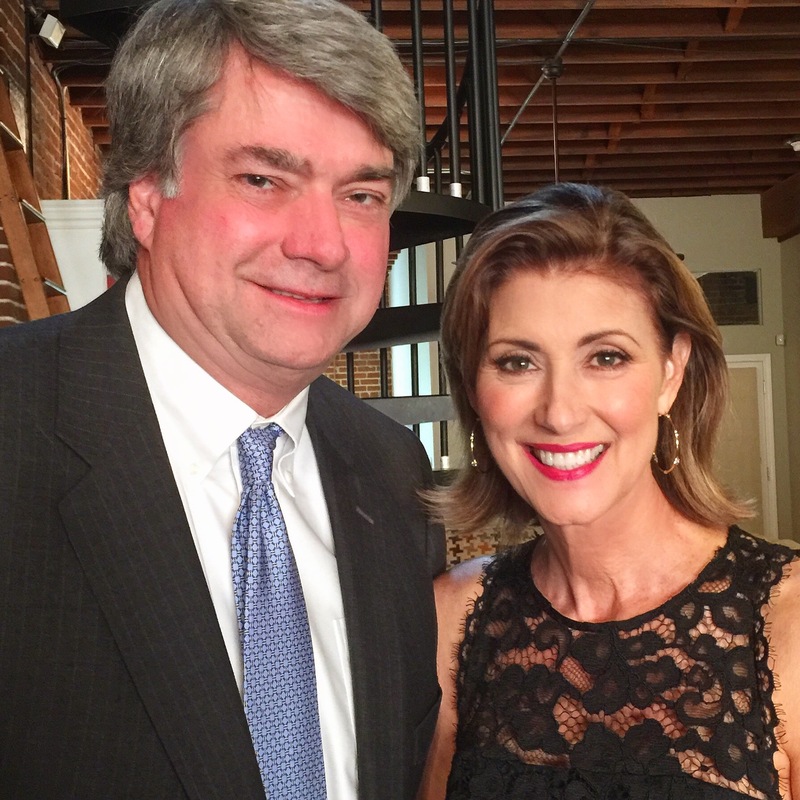 At the urging of a couple of my clients I called Sarah Humphrey at Bella MD for help. I have to say that I was really pretty scared to go for the treatments but soon realized that nothing was that dramatic or painful. I had a wonderful experience overall and really trust Sarah and the staff at Bella MD. 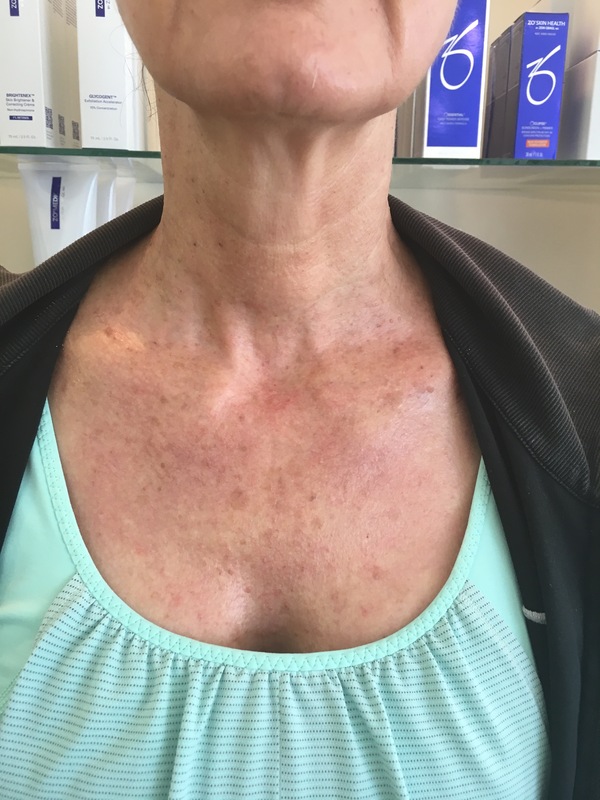 I was really pleased with the results and will definitely go back for some follow up treatments. 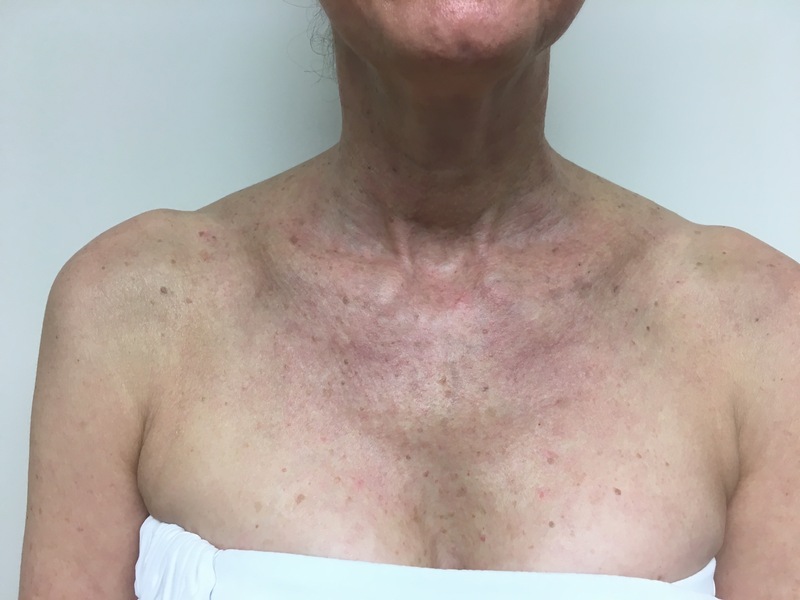 From what I understand it usually takes about 3-4 treatments to adequately remove the sun damage with the Photo Facial and Chemical Peel combo. My recovery time was about 2 weeks with a little peeling and healing left to occur, but not much. 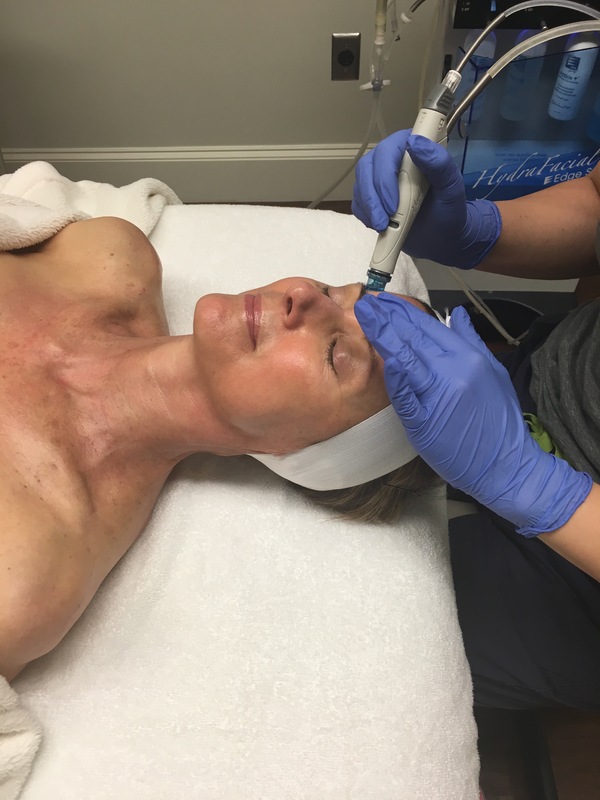 I also went back the Monday (week 3) before leaving for Memphis for a HydraFacial which exfoliates and hydrates the skin and promotes healing. Here are some before and after shots. 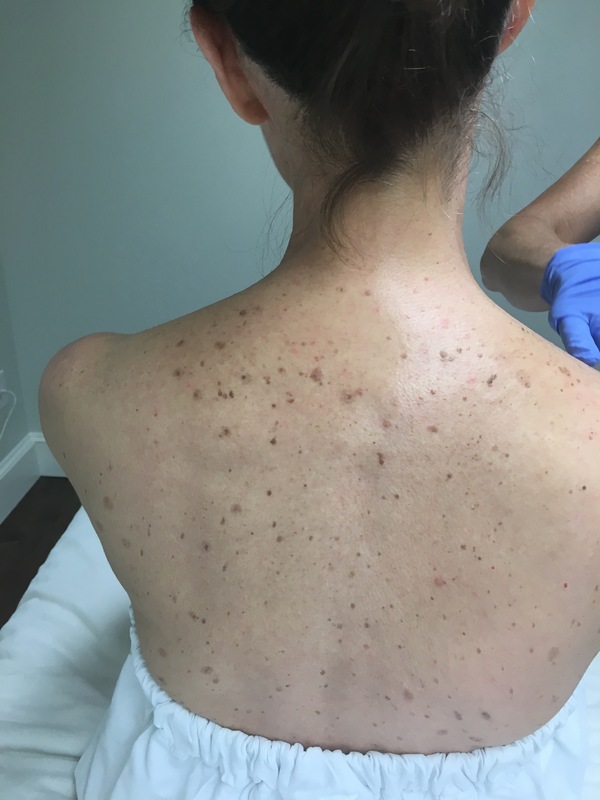 Before, during and after treatment. My back in the third shot is much lighter and still has some healing to do. But overall it looks much better and I can see a difference which is very encouraging! I’m in for more treatments! I must be shameless to share these very revealing photos with you!!! It’s kind of too much reality!! 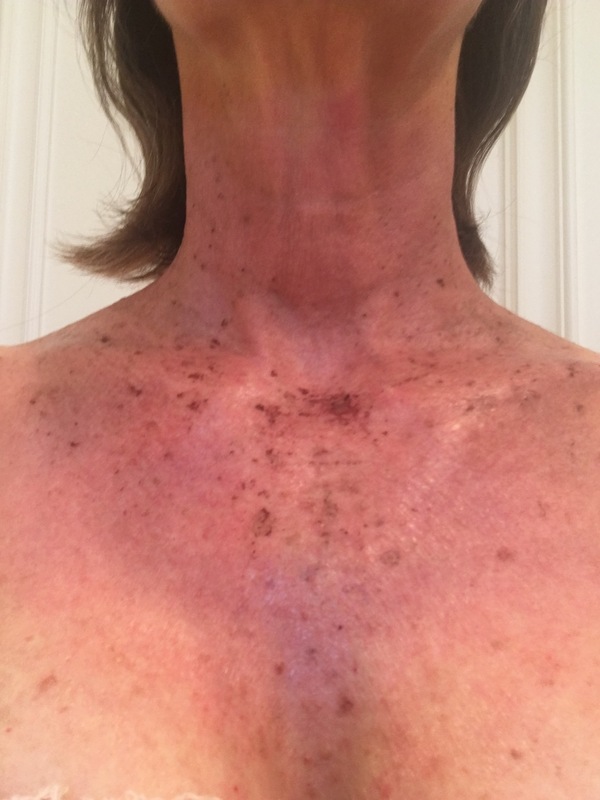 Above you can see after Photo Facial, after Chemical Peel and then before the HydraFacial. 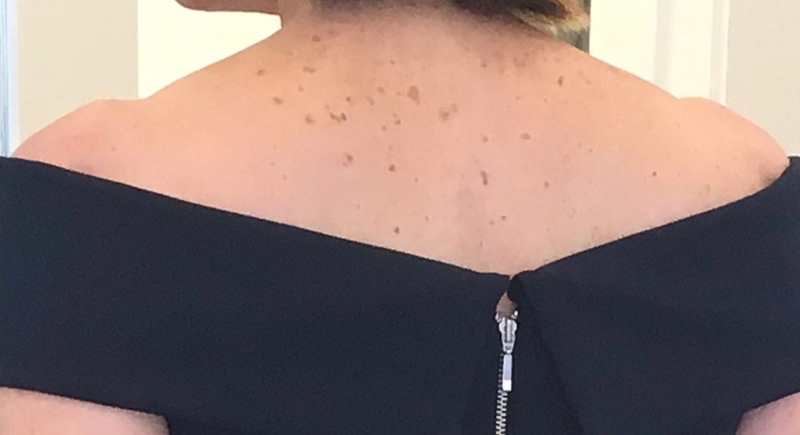 I don’t really have any great shots of my neck and chest before we started the treatments, but I can see a huge difference and a lot of sun damage and tiny black spots are gone from my neck. My chest looks so much better and I wish I had more professional photos to share with you. You can be sure there is no special lighting or retouching here!!! All I can say is that I am a perfectionist and I am so glad I had these treatments before the wedding. I can definitely see progress. 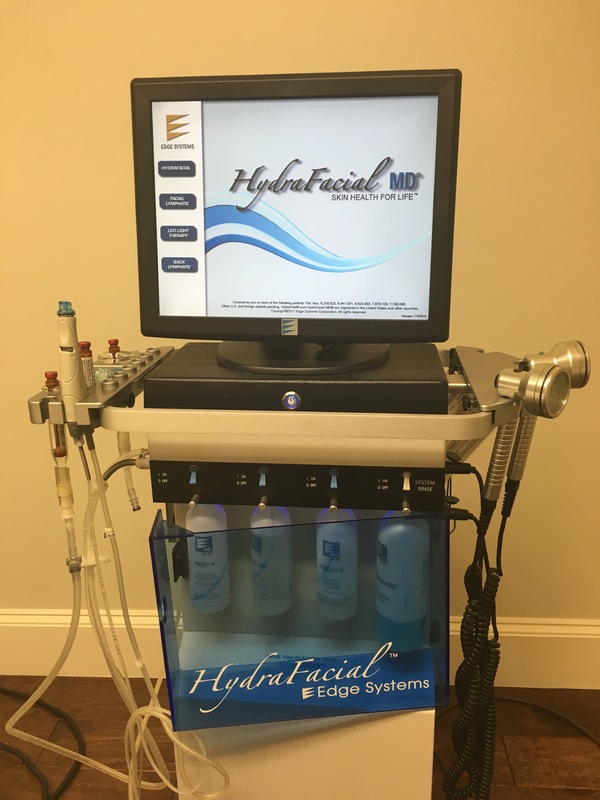 This is the HydraFacial which is a treatment that removes dead skin cells and extracts impurities while simultaneously bathing the new skin with cleansing, hydrating and moisturizing serums. 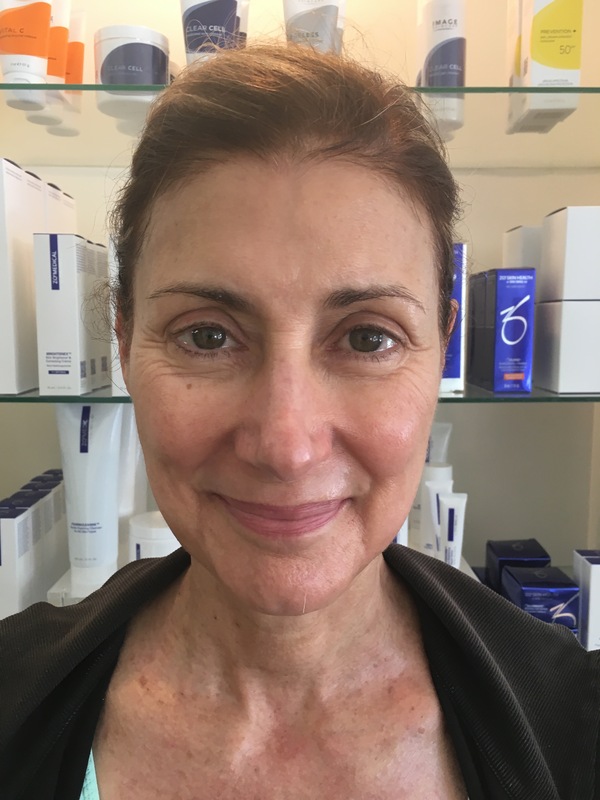 This is a resurfacing procedure using a Vortex-Fusion of antioxidants, peptides, and hyaluronic acid. It was the perfect finale to all of my procedures and really got my skin ready to for the wedding. I have to say that I have become super neurotic about wearing sunscreen and covering up the treated and sensitive areas. I just want to protect my investment and prevent further damage!! 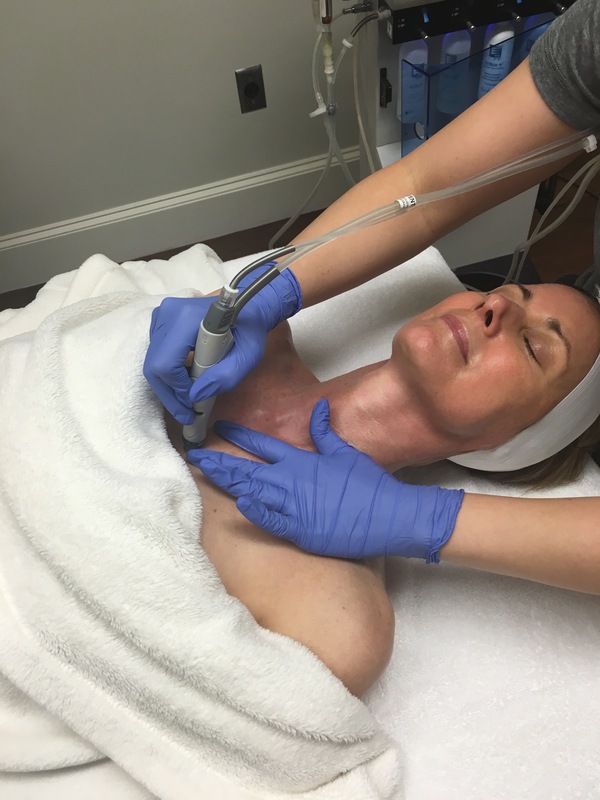 Above you can see the skin immediately after the HydraFacial. I cannot tell you how much better my skin looks on my face, neck and back. 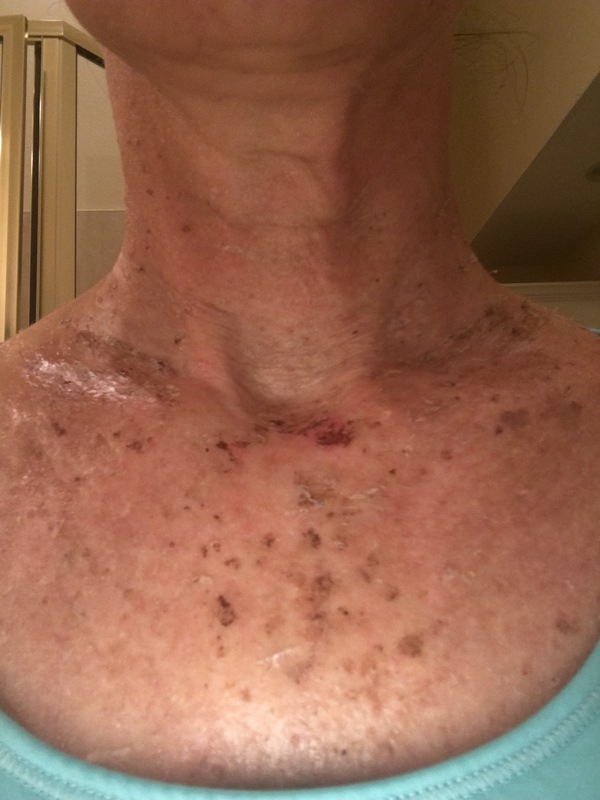 As I said, I realize that this is a commitment and a long term process to remove many years of skin damage. Now I feel like I have a plan for my skin care moving forward. And it was a really great reminder to protect my skin with sunscreen every day. Ready for the Rehearsal Dinner on Friday night. 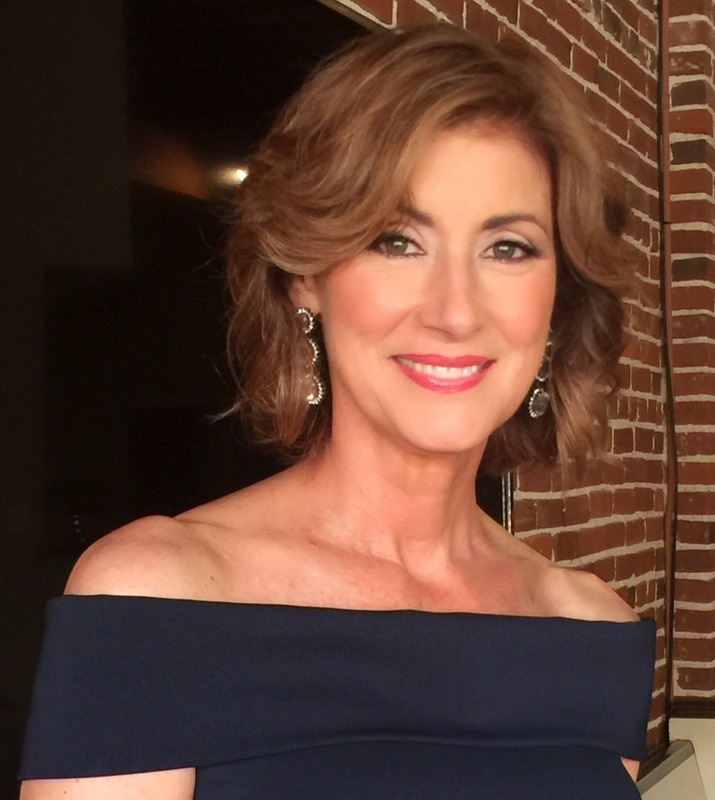 Thank you to our dear friend LB Rosser who was with us every step of the way and took time to do my make up this night. What a fun surprise. LB is the best!!!!! It’s show time and I am ready for the wedding Saturday evening. LB slaved away and did hair and make up on 6 of us before getting ready himself!! I am so happy with my new and improved skin!! Thank you Sarah and Bella MD for getting me ready for the big event. 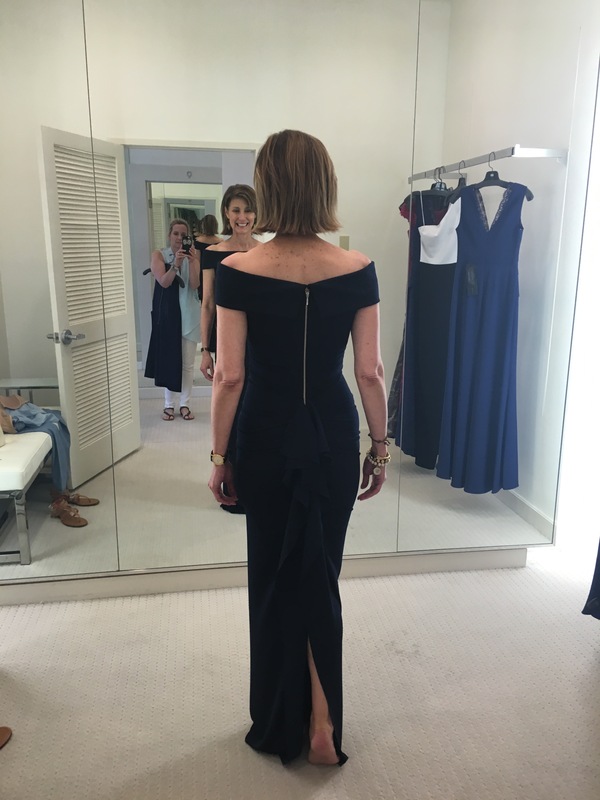 Thank you Betsy Gallagher at Tootsie’s for finding my dress and forcing me to shop. Thank you LB Rosser for making us all feel beautiful and for being such a supportive friend and bonus family member!! LB even touched up Timothy before he went down the aisle!! Tyler (no hair and mu), Sara ,Liz, me, Roxanne, (our friend Krista), Victoria, Granny and LB! 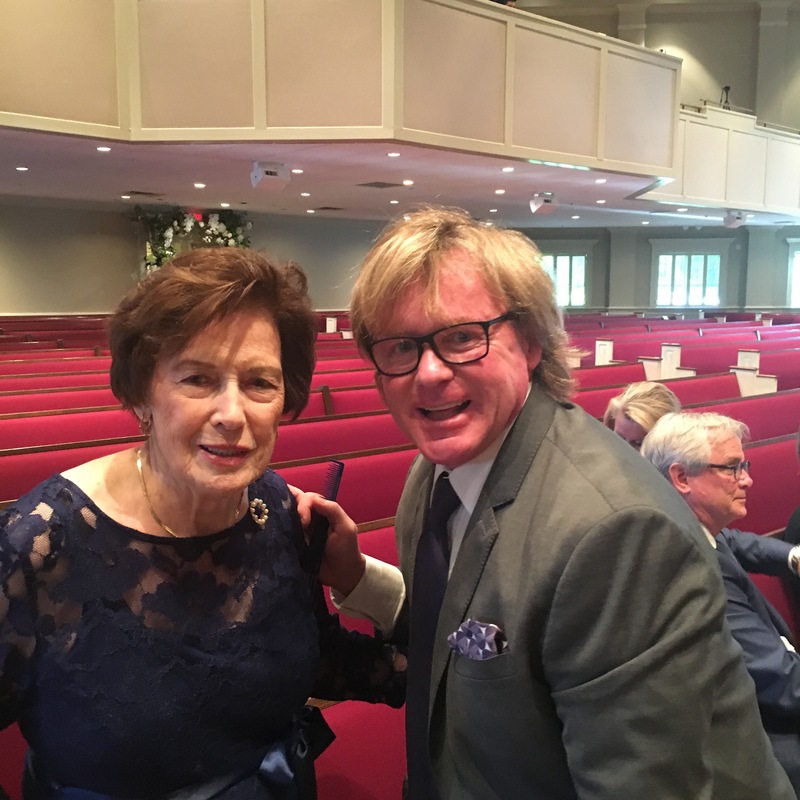 Stay tuned for a blog on the wedding and fun times in Memphis!! It was pure joy with many blessings!! You rocked it … Perfect Dress, looks gorgeous on you! Hi Virginia, It is always great to hear from you and I so appreciate your reading my blogs!!! I love your feedback and am very flattered!! I will look forward to seeing you when you are ready. Glad to hear you are lightening up around the house. Always a good idea!!! Less is more, I always say. Kind of a great feeling to let go and have more space and time on your hands!! Happy Summer!!!! You look great! Thanks for sharing the scary pictures with the beautiful results! What a great blog! I love the before and after pics! I’m really thinking about doing the Bella M.D. now!! 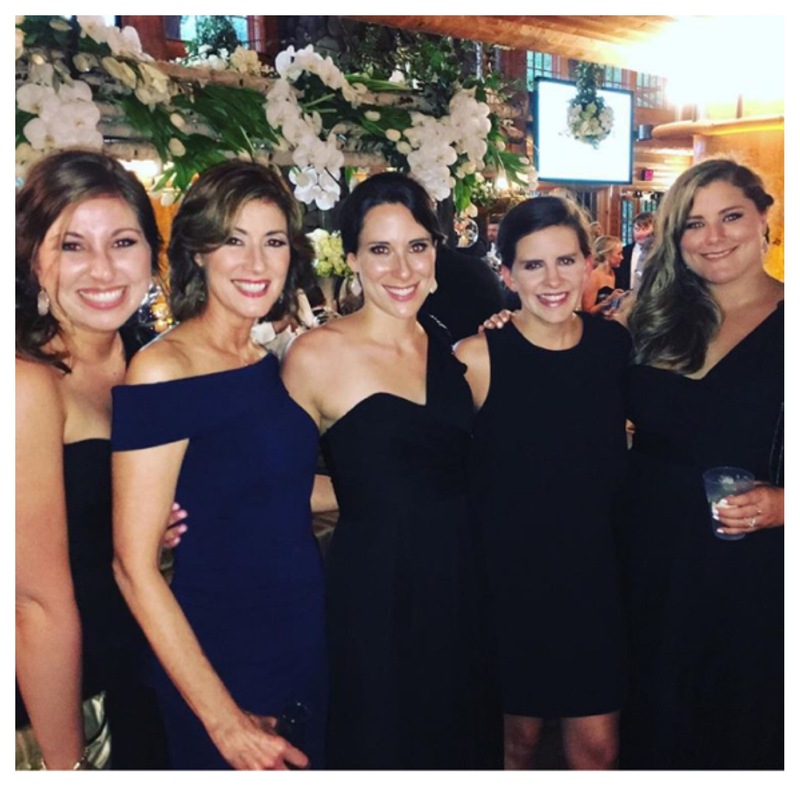 You looked BEAUTIFUL at the wedding – so much fun!! !